Winter is here, there is a chill in the air, crisp snow on the ground, and icy rain is bucketing down. Working in the garage will now be a daunting task and fiddling with equipment with frozen fingers is no fun at all. You have the option of abandoning your workbench, and your garage all together and wait for the warmer months. However, you also have the choice of getting a garage heater to warm up your workspace. Garage heaters produce a lot of heat in a short period warming up spaces rather fast. Nevertheless, there are several options in the market and getting the right one for you can be a demanding task. Therefore, we took it upon ourselves to narrow down the best garage heaters so that you don’t have to put in the work. Topping our list of the best options is the MH18B. The MH18B is a portable unit and uses two 1-pound propane jugs. To hold the two propane canisters in place, this unit features swing open hatch doors. It can be attached to a 20lb or larger propane tank but more on that shortly. The MH18B is enough for a space up to 400 square feet, and it can warm it up in about 10 to 20 minutes on the high setting. On the low heat setting, the unit can last for about 8 hours. Another fascinating feature is the piez0-electric switch that makes lighting this unit a breeze. Just move the switch to pilot, and the spark ignites a small flame at the bottom of the tile. You can then adjust the heat to your preferred setting up to 18,000 BTU. You will have to purchase some 4D batteries to power the blower fan or invest in a 6-volt adapter. We recommend the former owing to portability. Moreover, there are the swivel regulators that swing out making it easier to attach the canisters without tilting them at a funny angle. Finally, connecting larger propane tanks is a walk in the park as you can use the “quick release” feature that will bypass the internal regulators. You can also connect a hose to the MH18B regulator allowing you to use the unit’s regulator as opposed to purchasing a new regulator. Nevertheless, our best features were the wire guard and the anti-bump safety. Wire guard – The ceramic heating element is delicate and thus needs to be protected from outside elements. However, the wire guard does more than protect the ceramic tile but also keeps users safe. It prevents accidental contact with the heating element. Anti-bump safety – The MH18B has a shut-off feature in case you knock it over. We recommend the MH18B for people with small garages that aren’t connected to power and gas lines. It features a hose storage bay for not more than 12 ft. The unit is compact measuring 11.2 by 14 by 12.5 inches and thus best for areas where you have limited mounting space. However, don’t let the machine fool you as it is powerful and can heat a small to medium-sized (about 500 square feet) garage. The Fahrenheat FUH54 is a fan-powered unit, and thus you don’t have to concern yourself with carrying the unit around. And thanks to the mounting bracket, you can install it in a strategic position to ensure even distribution of hot air. The FUH54 is an electric unit and has an amperage of about 26.1 amperes while most homes have a 20-amp breaker. As such you cannot plug and use, but you have to invite an electrician to adjust the wiring. The metal louvers on this unit are another fascinating feature as it allows you to direct heat to any desired area. The rugged, heavy-duty construction ensures durability. However, our best features were the delayed fan action, and the automatic shut off. Automatic shut off – To avoid damage in the event of overheating, the FUH54 features an automatic shut off. Delayed fan action – The fan isn’t activated until the preset temperature is reached. Thus, no cold air is released into the garage. Another fascinating feature is that once the preset temperature is reached, the heater turns off to prevent overheating. The Fahrenheat FU54 is best for small and medium-sized garages. We also recommend it for people with limited space as it is compact. 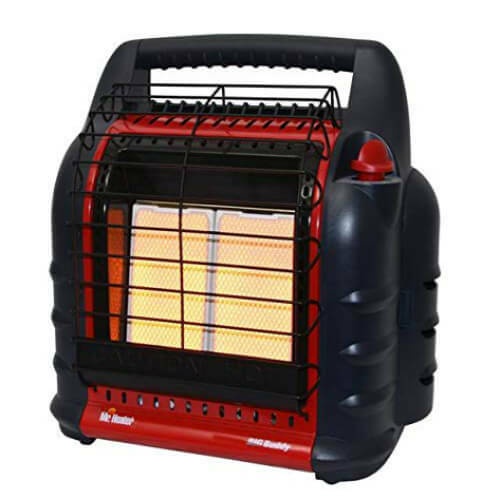 If you are looking for a portable unit, we recommend you get the Mr. Heater F232000 Buddy. This unit is designed for personal use and thus great to carry around the garage. Moreover, it is an affordable unit for people on a budget. First, you will love how colorful it is. Yes, it is only available in black and red, but that is still colorful compared to other units that are often gray. Other than the appeal, it is also build to be safe and durable. First, it is wrapped in thick rubber, so it doesn’t burn you or your kids accidentally. It also has a cool-touch wire guard that will protect you from the ceramic heating element. 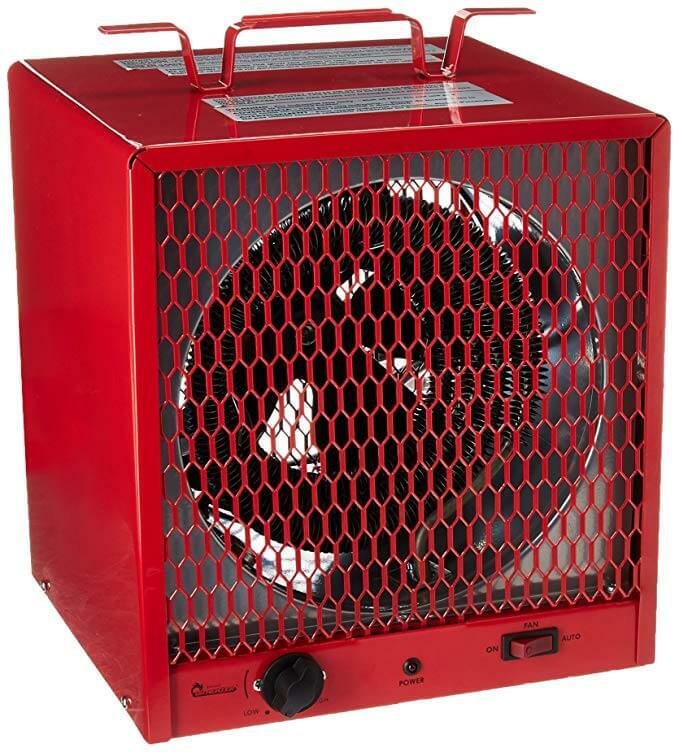 Mr. Heater Buddy has a BTU between 4,000 and 9,000 and is ideal for spaces up to 200 square feet. It is approved for both indoor and outdoor use. You can use the unit with a 1lb tank, but you need a hose and an adapter if you are to use it with a 20lb propane tank. As for the best features, we loved the low oxygen sensor and the ergonomics. Low oxygen sensor – Seeing as this is a propane tank, it produces toxic fumes, i.e., carbon monoxide which is lethal especially indoors. As such the low oxygen sensor will shut off the unit and prevent the buildup of CO. Furthermore, there is an auto shut-off feature that is triggered in case the device tips over, or when you pick it up. Ergonomics – Thanks to the carrying handle, you can effortlessly pick and move around with the Heater Buddy. Also, it weighs only 9.8 pounds and thus is highly portable. The MH9BX is excellent for personal use, especially by hunters or campers. Also, it’s superb for use in small garages or where you need the portability. The DR966 is designed to be practical and not to impress. As such it features the common grayish white color. However, the performance is exceptional for such a compact unit. Measuring 14.5 by 14.5 by 13-inches, it will work for people who have limited installation space. You can install it on the wall or ceiling, or put it on the floor. It weighs 27 pounds which is neither light nor heavy, but weight isn’t a concern for a mounted garage heater. Another exciting feature of the Dr. Heater DR966 is the simple controls, other than the switch button; it only has a thermostat that allows you to select between high and low. This unit needs to be hardwired, and you should engage an electrician for this. Our best features though were the quality and louvers. 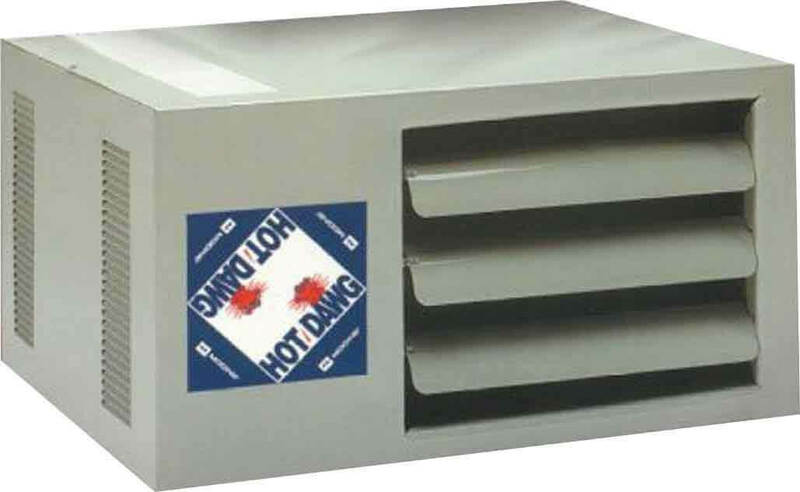 Louvers – The adjustable louvers allow you to direct heat in any direction. Moreover, the 8” fan will disperse heat with minimum noise. Quality – As pointed out earlier, this is a commercial grade unit, and thus it is built to last. The equipment is durable steel with a grey epoxy finishing for protection; the heating is by spiral metal that ensures long life. Moreover, all this uses heavy duty ball bearing motor that is not only top quality but is also thermally protected. We recommend the DR966 for people with large open spaces but with limited, mounting space. Dyna-GLo is a heavy hitter with an impressive 30,000 to 60,000 BTU, higher than most other options. It is a propane device, and you will need at least a 20lb propane gas. The unit retails with a 10’ hose and regulator which is a nice touch as it makes assembly easier. The device is enough to cover 1,350 square feet, and the heat angle is adjustable for comfort and control all thanks to the adjustable leg. A fascinating feature of the RMC-FA60DGD is the shut-off safety sensor that powers down the unit. You will also appreciate the continuous ignition as it prevents dangerous delayed ignition. The overheat auto shut-off feature protects the apparatus should it overheat. Our best features though were the quality and low pressure. Low pressure – With a 0.5 PSI, the Dyna-Glo RMC-FA60DGD uses the lowest pressure which keeps you safe in case of a leak. Moreover, it has a consistent BTU even in cold environments. Higher PSI can have lower BTU in cold weather and can freeze tank. Quality – The Dyna-Glo RMC-FA60DGD is designed to last. First, it features a steel base to last longer, and it has a split capacitor motor that is efficient, has better performance, and durable. The burner is the most durable in the market. It is brass and close to indestructible. Finally, the motor is mounted on a sturdy bracket so that the motor and fan are always aligned. This Dyna-Glo is best for people with large spaces that aren’t connected to the power grid. Also, if you are on a budget, consider purchasing the RMC-FA60DGD. Another affordable unit, the Dimplex should be on top of everyone’s list who is in the market for a compact unit. Measuring 11 by 7-2/7 by 9-inches, it is one of the smallest heaters in the market, and we recommend it for anyone with limited mounting space. Moreover, it is lightweight and thus easy to install. For safety purposes, Dimplex is an electric unit, and thus you don’t have to worry about toxic fumes. You will also appreciate the rugged design of the unit. First, it is designed to be practical and thus don’t expect it to stand out. However, this piece of equipment is durable steel and thus will serve you for more extended periods. You will also appreciate the stainless heating element as it saves you from regular inspection. Another fascinating feature is the automatic temperature control. Depending on the temperature, the Dimplex DGWH4031 will adjust the heat it produces. Our best features though were the swivel mechanism and the fan delay. Swivel mechanism – While other units feature adjustable louvers to direct heat, this Dimplex has a swivel mechanism for horizontal control. Moreover, it has a 6’ cord to support the swivel motion. 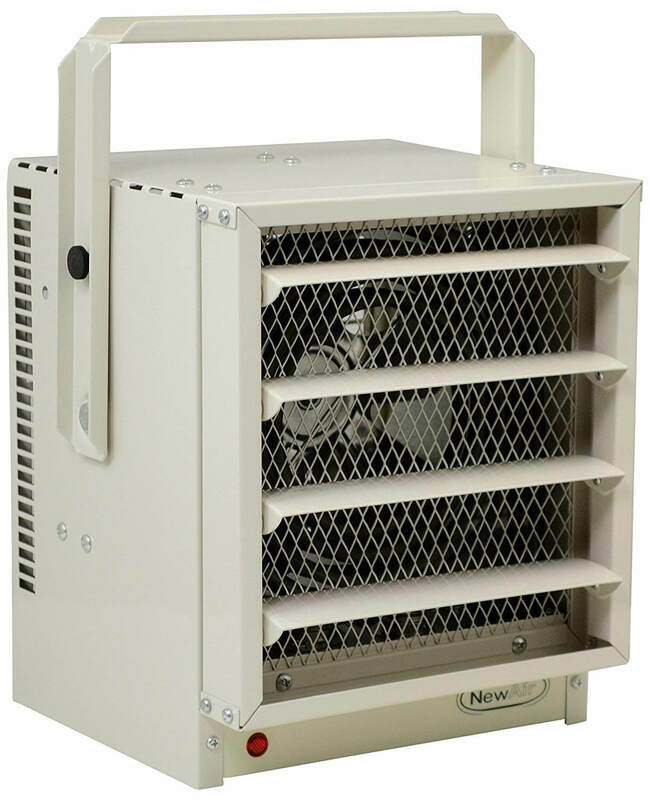 Fan delay – With the concern of rising heating costs, the DGWH4031 is designed to be efficient, and one way to achieve this is the fan delay, and thus it uses residual heat. The Dimplex DGWH4031 is designed for people with small garages, or with limited mounting space. If cost isn’t a concern, we recommend you invest in the Modine HD45. With a 45,000 BTU, it is one of the most potent units in the market. It is certified for residential, and industrial use and we recommend it for any large space. The unit measures 26 by 12 by 16.5-inches, and you will appreciate the low profile design as it allows it to blend in any area. As for weight, the unit weighs about 60 pounds, but this isn’t much of a concern for a hardwired unit. The gadget operates with both natural gas and propane and accommodates piping either from the left or the right depending on the design of your garage. Finally, seeing as this unit produces toxic fumes, you will appreciate the standard exhaust for side-wall or roof-venting. Our best features though were the separated combustion model and the silence. Silence – The top reason why you should get the HD45 is that it is a quiet machine. Separated combustion model – The Modine HD45 is available in separated combustion and power exhausted model. The separated combustion model draws fresh, clean air from outside has better seasonal heating efficiency, more durable, and features an external gas connection. We recommend the HD45 for commercial purposes owing to the price point. However, it is sufficient for large garages. Another hardwired unit, the NewAir G73 can heat up to 750 square feet with ease. Therefore, if you have a small to medium garage, we encourage you to get this unit. It is a compact unit measuring 9 by 9.5 by 14 inches and thus will not occupy much space. Moreover, you can mount it on a wall or ceiling which is ideal in small garages where space is limited. Finally, there is the peace of mind that comes with a mounted unit as you don’t have to concern yourself with ensuring that plastics and flammable items are kept away from the heater. Another fascinating feature is the built-in thermostat to control the heat it produces and the automatic shut-off to protect the appliance from overheating. Our best features though were the durability and the adjustability. Durability – The NewAir G73 is built to last as it is stainless steel construction. Moreover, the heating element is stainless steel for better and longer performance. Finally, it is a hardwired unit to avoid the issues associated with gas and propane units. Adjustability – First, this heater has a swivel joint that gives you horizontal control over where to direct the heat. However, it also has louvers that give you vertical control. The NewAir G73 is for people with small and medium-sized garages up to 750 square feet. The strong point of this unit is the portability but more on this later. It cannot be ceiling or wall mounted and thus do not purchase it for that purpose. This unit is best for small spaces up to 600 square feet. If you have a slightly larger garage, you can get two of this and set them in different parts. The max temperature this heater can get is 95®F which is more than enough. Our best features though were the portability and the thermostat. Portability – If you are in the market for an option that you can carry around, we recommend you get this DR988. First, it weighs a mere 12 pounds and easy to move. It also features a quality handle on top which doesn’t heat up thanks to the solid construction. The NEMA 6-30P power cord also aids in portability. Thermostat – The DR988 features an in-built thermostat that helps that enables you to keep temperatures at a safe and regulated level. Finally, the unit has a fan that does an excellent job distributing heat throughout your workspace. The DR988 is best for people with small spaces or who appreciate the portability you get with this unit. It is also perfect for semi-outdoor work. Most options feature in-built thermostats, but not the Heatstar, and we would recommend if you are looking for an appliance that gives you more control. This unit is designed to be mounted on an upper wall, but you can still install it on the ceiling. 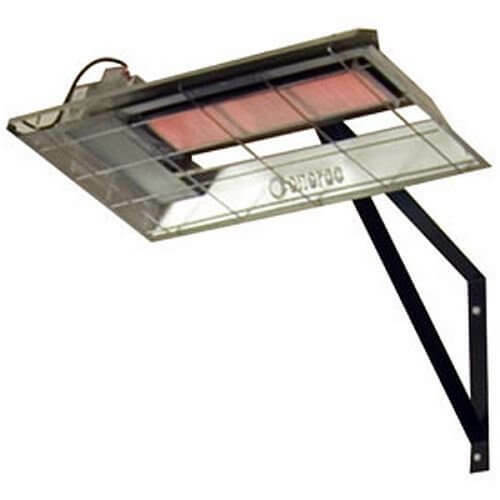 Being an overhead heater, it is for low-profile buildings about 7 or 8-foot high, and it can warm up about 500 to 700 square feet. Heating the space will be a bit difficult, but the heater can cover a larger area if all you want to do is maintain a constant temperature. The heater includes a wall vent for better ventilation. As a precaution, install CO detectors in your garage in case of carbon monoxide build up. This appliance uses natural gas and installation is straightforward provided there are gas lines in the garage. Otherwise, you have to contact your utility company to install the pipes. Thermostats – The remote thermostat is a nice touch as you can install it 50ft away from the heater depending on the cable. This allows you to warm up the garage in advance. Fuel efficiency – The Heatstar is about 99.9% efficient, and thus you need not worry about high utility bills. The Heatstar by Enerco is exceptional for areas where a permanent heater is required. Say a garage, a workshop, a loading dock or even construction sites. First, you are looking for a unit that is appropriate for your garage. If you have a large garage, you want an appliance that will provide enough heat. A small apparatus may not have the power to heat the garage. On the other hand, you don’t want a large appliance in a small area as it might cause your space to be too hot and stuffy. You also have the option of a free-standing unit that can sit on the ground and is portable. A free-standing goption saves you a fortune as you don’t have to invest in a large radiator. Finally, consider the height of your ceiling. If you have a high ceiling, say 6 feet high, we recommend you invest in a powerful machine. Though most options are powered by electricity, you can still opt for a unit that runs on propane or natural gas. Natural gas garage heaters are efficient, and natural gas is clean. You have to install gas lines so that you can hook up your heater, which is quite pricey. However, the initial cost will save you from operating expenses in the future. These units can burn LP or natural gas, and they leave behind toxic fumes thus a venting system is needed. Electric units, on the other hand, are all the rage as they produce a consistent amount of super-heated air. They are great for small and medium areas but not suitable for large areas. They have an automatic turn-off switch in case you knock it over increasing the safety. 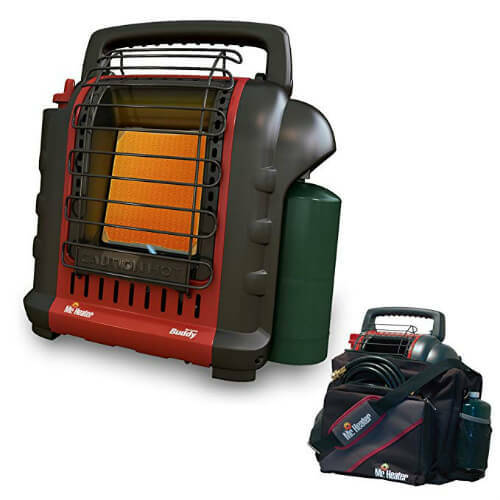 Propane heaters, on the other hand, are economical options and heat spaces fast. If you are working in a small space, we suggest you get a radiant or infrared option. 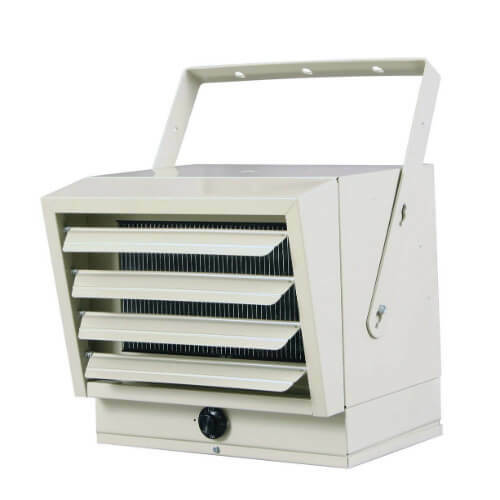 These units localize heat and are robust for small and medium areas. You can choose between a free-standing a portable radiant heater, and a wall-mounted unit. Fan-forced heaters, on the other hand, are great for large spaces. They can fill the space with warm air making it more conducive. They draw in cold air, pass it through the strong heating element, and blow it out into the room. However, they aren’t ideal for small spaces as they draw out the air making it stuffy. 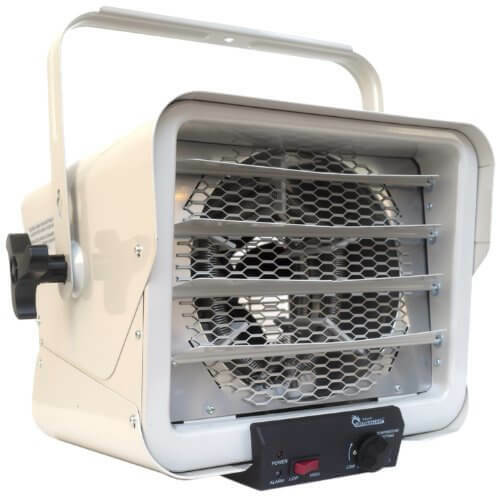 Some fan-powered heaters allow you to turn off the heat but leave the fan operational. Seeing as this is a heater, you want a unit that incorporates safety features. Some few to look for include a cool touch or wire guard that protects you from the hot surface. Also, consider an appliance with overheating protection. It could be an automatic switch off, or a high-temperature safety switch make sure your unit turns off before it overheats. Finally, there is the tip-over switch mostly found on electric units that turns off the unit in case it is knocked over. There are some additional features you might want on your appliance. 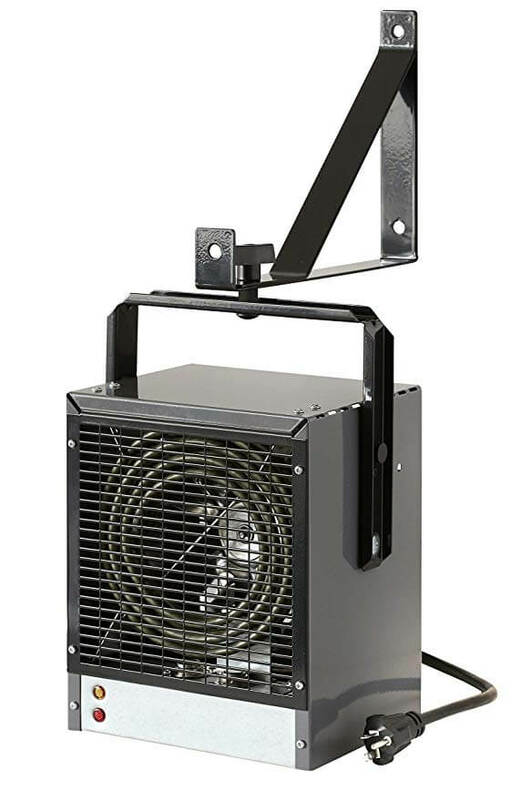 Adjustable louvers allow you to direct heat, a lengthy power cord increases the portability of the unit, while a carrying handle makes it easier to carry the unit. Are electric garages powerful to provide enough heat? Well, this depends on the wattage of the unit and the size of your garage. A small electric heater with low wattage can only be enough for a small garage. It will not suffice in a large garage, and the cost of operating it would be high. If you have a large garage, we recommend you get an appliance with a high wattage. What is BTU and why is it important? BTU is the acronym of British Thermal Unit and is the energy required to raise the temperature of one pound of water by 1 degree Fahrenheit. The BTU of a unit tells you how much room or space in square feet the unit can warm up. How do I calculate the appropriate BTU for my garage? When investing in a garage heater, you want to ensure you get an appropriate unit that is enough for you. Without enough information, you can get a small unit that will not suffice and will be too expensive or a large option causing discomfort. Though some guides give you a ballpark range, we recommend you carry out the following calculations to know the exact BTUs you need. First calculate the cubic footage of your garage by multiplying the width, by the length, and by the height (Say 10ft by 10ft by 10ft resulting in 100c cubic footage). Next, get the difference between your preferred temperature and the lowest temperature in your area. Say you want to maintain a temp of about 65®F, and the lowest temperature is 15®F. The difference will be 50®F (65-15). Next, you have to account for the insulation in your garage by picking a variable. For excellent insulation, pick the variable 0.5, 1 for average, 1.5 for little padding, and 5 if your garage isn’t insulated. Multiply the insulation variable, by the cubic footage and the heat rise required and then divide it by 1.6 to get the BTU. Assuming you have excellent insulation, the formula will look something like this; (0.5 * 1000 * 50)/ 1.6 resulting in 15,625 BTU. For a safety margin, we recommend you add a 10% to the predetermined BTU by multiplying it by 1.1 (15625 * 1.1 = 17,187.5). How can I make my heater more efficient? Inevitably, such a device will increase your utility bills, and it will be higher if your garage isn’t constructed appropriately. To avoid high bills, we recommend you get insulate your garage. You can try foam or plastic or something removable if you are renting the space. Insulation increases the heat efficiency as it reduces heat loss. Moreover, you can couple your heater with halogen lighting as it can warm up the room too. Finally, ensure that the garage door seals to the floor for efficiency. You will incur higher bills if there is a gap where cold air is seeping in. 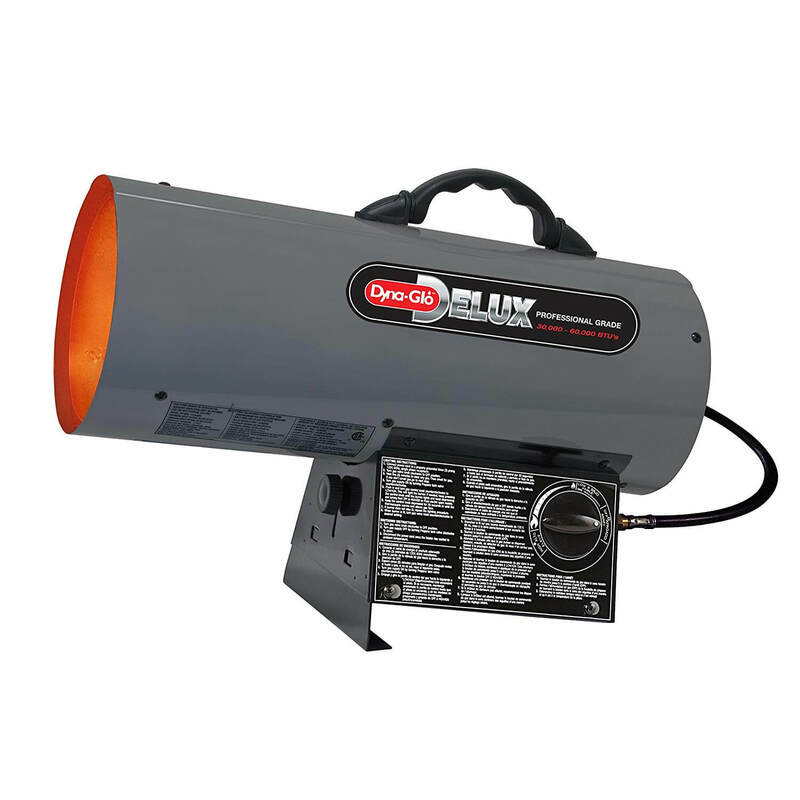 Garage heaters are the best option for your workspace. Whether you use it for work or you are in the market for an appliance to keep your cars and other items warm, a garage heater will suffice. The units above are the best currently in the market, and we are sure that you will get one that’s suitable for you. Finally, be sure to leave a comment and tell us what you thought of the guide.